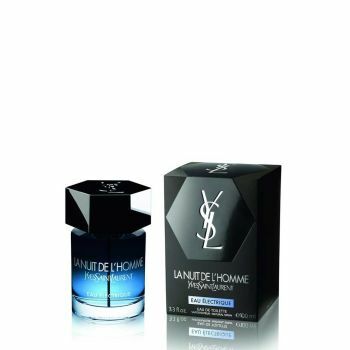 Be at the utmost of seduction with this new electrifying eau de toilette for men. Fresh, intense and sensual, this fragrance will be your best weapon throughout the night. An uninhibited and intoxicating fragrance. An oriental fougère that forms the bridge between freshness and sensuality. It opens with a burst of ripe apple accord. Curving into the warm heartbeat of geranium; the senses are heightened. Slowly evolving, revealing itself, sensual – aphrodisiac – vanilla rises upward, striking through like an electrical current. A play of contrasts: the first spritz invigorates the senses, while the trail leaves a statement of corporeal sensuality. An olfactive electric shock as intense as the deep blue of its juice.